NASA's New Horizons spacecraft took this photo of Pluto on July 13, 2015, from a distance of 476,000 miles (768,000 kilometers). When NASA's New Horizons spacecraft made its closest approach to Pluto yesterday (July 14), becoming the first probe to study the dwarf planet up close, people around the world celebrated the historic moment. More than 1,000 people gathered at New Horizons' mission headquarters at the Johns Hopkins University Applied Physics Laboratory in Laurel, Maryland, to celebrate the space probe's close flyby of Pluto yesterday morning. At 7:49 a.m. EDT (1149 GMT), the crowd cheered and waved American flags, while 3 billion miles (4.8 billion kilometers) away, the probe made its close approach. President Obama had this to say via his official Twitter account, @POTUS: "Pluto just had its first visitor! Thanks ‪@NASA — it's a great day for discovery and American leadership." Hawking delivered his reaction in a video message posted to Facebook: "I would like to congratulate the New Horizons team and NASA on their pioneering, decade-long mission to explore the Pluto system and the Kuiper Belt. Billions of miles from Earth, this little robotic spacecraft will show us the first glimpse of mysterious Pluto, the distant icy world at the very edge of our solar system. It is 50 years since the first successful mission to Mars, Mariner 4, sent back 21 images of the Red Planet. Now the solar system will be further opened to us, revealing the secrets of distant Pluto. The revelations of New Horizons may help us to understand better how our solar system was formed. We explore because we are human, and we want to know. 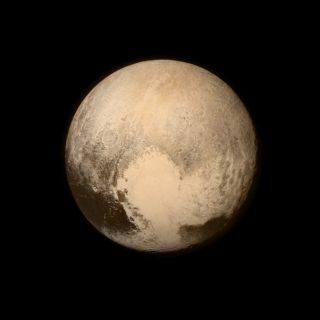 I hope that Pluto will help us on that journey. I will be watching closely, and I hope you will, too." Bill Nye, CEO of The Planetary Society and former TV "Science Guy"
In a statement from the Planetary Society, Nye had this to say: "This mission is a big deal for humankind. The interest in this part of the solar system couldn't be higher. Who hasn't wondered what Pluto is like? Congratulations to the project team and thanks to citizens everywhere who supported it. There's a lot of space between us — the Earth and this distant world — and New Horizons has crossed it. For the first time, we all see what's out there, up close. This is an extraordinary moment: reaching the next unexplored frontier in our solar system. Through the power of people — scientists, legislators and inspired space enthusiasts — our dream to explore our beloved dwarf planet is a reality." Holdren made his thoughts known in a statement: "I’m delighted at this latest accomplishment by NASA, another first that demonstrates once again how the United States leads the world in space. New Horizons is the latest in a long line of scientific accomplishments at NASA, including multiple missions orbiting and exploring the surface of Mars in advance of human visits still to come; the remarkable Kepler mission to identify Earth-like planets around stars other than our own; and the DSCOVR satellite that soon will be beaming back images of the whole Earth in near real-time from a vantage point a million miles away. As New Horizons completes its flyby of Pluto and continues deeper into the Kuiper Belt, NASA's multifaceted journey of discovery continues." Grinspoon spoke at the live close-encounter event at AMNH this morning: "It's one of those moments. I remember being in fourth grade for the Apollo 11 landing on the moon and being 16 years old when Viking landed on Mars and being a young post-doc during Voyager at Neptune, and those moments are etched into my brain. I can feel that this is one of those moments now where we've expanded our consciousness. We've reached not just another world but another zone of reality, of our universe. And it's just amazing to be here with the people that are making this happen, and experiencing the real-time thrill of it all. "It's very gratifying because these people on this mission are my great friends from 20, 30 years ago that I went to grad school with. We were the kids, and now it feels like this is our generation of planetary scientists, in a sense, and our mission. They're all multi-generational, but I feel like a sort of torch being passed, and I'm really proud of the team and the scientists and I'm so excited and as a human being I feel we have now expanded our awareness of the universe we live in." Stallmer delivered his reaction in a statement from CSF: "CSF applauds Alan Stern and his team for their hard work, dedication and patience that they have displayed throughout this program. It is heartening to see the benefits that are already being reaped as well as the excitement that New Horizons has garnered around the globe. Through Alan's work at the Southwest Research Institute, World View and Golden Spike, he continues to push the boundaries of the commercial spaceflight industry to ever-higher horizons. We are lucky to have his scientific expertise within our industry."